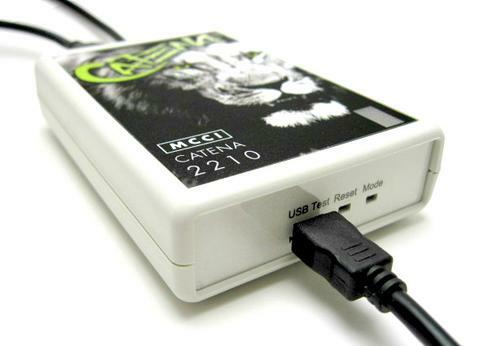 The Catena 2210 is a test tool with two USB Network Control Model (“NCM”) devices. These devices create a bridge between two USB hosts. Validation testing is made possible by connecting a test control computer to the USB host being tested. Ethernet traffic from the test host is transferred through the Catena 2210 device to the control host, and vice versa. 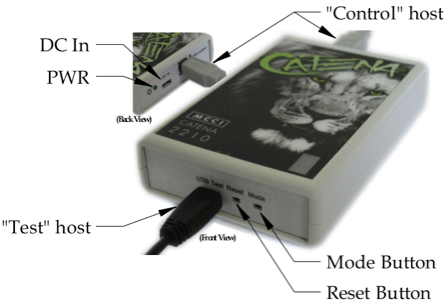 Because the Catena 2210 is based on the MCCI USB DataPump, it can be readily adapted to simulate USB-level behavior that is specific to a given device, and so can serve for USB-level regression testing for hosts that must be compatible with a wide range of devices. The Catena 2210 NCM Verification Tool was selected for use by the Car Connectivity Consortium (formerly, Terminal Mode Consortium). If you are a consortium member, you may purchase the Catena 2210 at a reduced price of $695 plus shipping. CCC members please contact sales@mcci.com for a coupon for the member pricing!